There has been a lot of interest in cryptocurrency, and I was recently interviewed in the Wall Street Journal and New York Times, so there's my 15 minutes of fame haha. It's interesting to see the contrast in viewpoints on this area. Two things that consistently come up: Is bitcoin wasting electricity? How many jobs does it create? Well, it's complicated. One of the unfortunate side effects of bitcoin, which was definitely unintended, is the proliferation of large scale, centralized mining. Bitcoin was intended to be highly decentralized, but the rise of ASICS (the specialized computers we use that do only one thing: SHA-256 encryption) created a situation ripe for widespread centralization and industrialization of it. And that's exactly what we're seeing here as more and more people see the virtues in it. But this is just the beginning, cryptocurrency is still in its infancy and there are many more applications that are yet to be discovered for blockchain technology. Personally I believe it has many uses in the healthcare industry and I plan to push for that when I finally become a doctor. The New York Times article, while somewhat misinformed (he refers to the machines as "specialized hard drives" for example) brings up a good point. 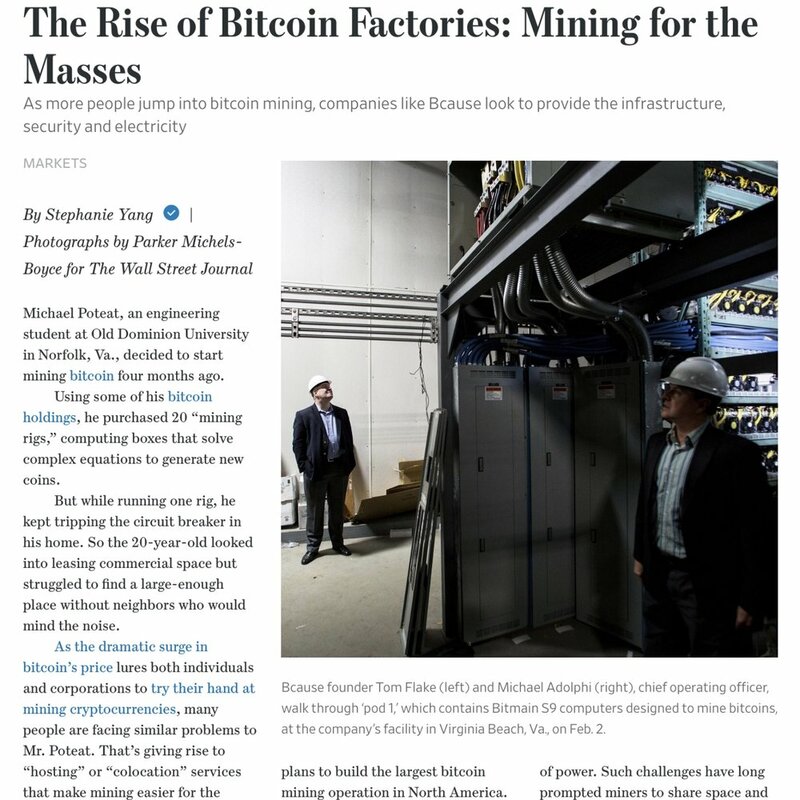 While I don't agree with his assessment that cryptocurrency has anything to do with low productivity, he essentially asks "why mine cryptocurrency when you have manufacturing next door that uses the same amount of electricity and employs hundreds of people?" Cryptocurrency mining is just not super labor intensive, an entire plant can be ran with a handful of people. But everything is also becoming automated and jobs are largely being lost to this. Look at how cars are made now (especially in Japan) versus how they were made in the '70's. Look at companies like Smartly, which has an MBA program that replaces typical classroom instruction with an app (giving this a try now!). Drones, self driving trucking? I think you get the idea. As technology advances, more jobs will be lost to automation. And to be clear, what bitcoin automates is banking, more or less, even though I would not exactly consider it a "currency" at the moment, but I hope to be able to at some point. On the issue of electricity usage, comparing bitcoin to a typical manufacturing plant is apples and oranges. It would be more fair to compare it to data centers, which currently consume about 5% of electricity in the US, and probably employs roughly the same number of people per amount of electricity. Or even the plethora of tech companies whose primary product is, in fact, not physical at all. On that note, how much electricity does the internet use? Bitcoin is a network in the early stages, and is, like the internet was, still somewhat unwieldy and looking for a useful purpose. I'm not sure what the future holds, but I do see an opportunity with cryptocurrencies and smart contracts. Still, I believe the issue of electric usage is a serious concern, especially if it's not coming from renewable sources. Like I talked about in my last post, upstate NY, and most concentrations of bitcoin mining operations in the US, use some sort of renewable energy. Typically hydroelectric. In our case, I believe there is an abundance of latent hydroelectric power that can still be tapped. Could the electricity be used more effectively to create jobs? I'd say yes. But where are those jobs going to come from? Will wages keep up with inflation? Will distribution of wealth become more equitable? Bitcoin is valuable as an asset because it deflates while fiat inflates. And yes, it seeks to take some power from banks and give it to the people. I believe in that aspect of cryptocurrency full heartedly. But now, because it's so profitable, this is not an aspect especially appreciated. Ryan and Tom working on the miners. One thing that is often overlooked is that mining supports other areas of development in physical products too and is opening up new industries utilizing the technology. Especially considering the businesses that actually build these ASICS, who can literally sell out of them in minutes! I would love to see one of these operations come in to upstate NY, which would create more jobs than mining. It's also created a many mining "shops" and suppliers that sell replacement parts, machines, and specialized equipment, a lot of which has been adapted or made for mining, which requires labor. On that note, in Plattsburgh this has led to the development of the Triangle Mining Box, which is an all in one solution for running and cooling the machines in a space efficient manner. 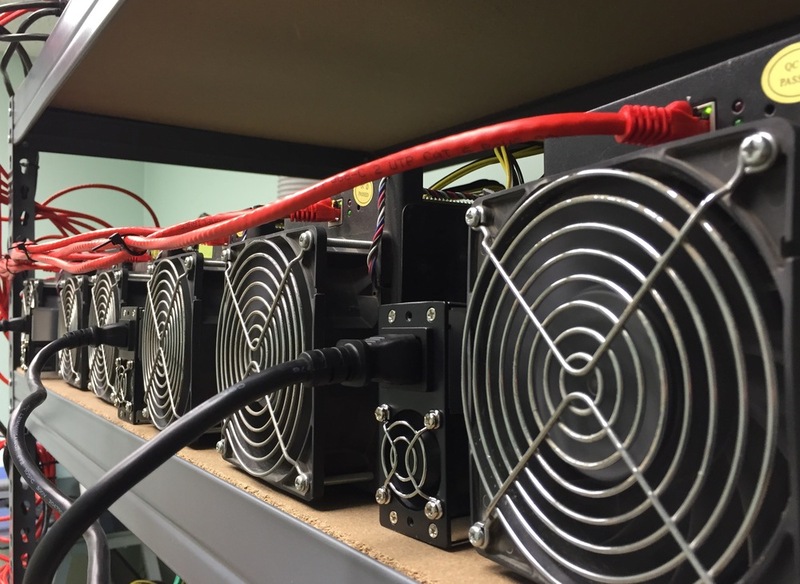 This was developed by Greg and Ryan Brienza of Zafra LLC, a local mining hosting company, since current server cases just don't fit the bill for the demands of cryptocurrency mining. They put their experience in building out mining operations and managed to find a better way than just throwing the machines on shelving units. We recently moved our machines into one of these, seen in the image above. They're made right in Plattsburgh, you can learn more about it here! I've very sorry about the time I've had to shut down mining for a bit. In a nutshell I had to turn off the machines for a bit because our lease expired and the new space I was hoping to be in took a little longer to finish than I'd hoped, so I ended up wiring up in the basement temporarily while we wait. Some other things have happened too. First, I've moved to Grenada to do medical school! I have been a bit busy on that front. But I'm finding time to get Plattsburgh BTC moving in what I think is the right direction. For one, I wasn't sure how I was going to be able to maintain my website and business with me going away to school. I either needed to sell it, hopefully to someone who could dedicate more time to it than I, or I needed to figure out a way to get some others involved. In truth I couldn't bring myself to part with Plattsburgh BTC. It's kind of my baby. So I brought my dad and brother on board. My brother started mining script a while ago starting on his laptop, and is studying to be an engineer. I figured this would be a great way to get into script mining, because I'm 100% committed to offering this in the very near future. My dad will be retiring from his job and has tons of experience and shortly, time. Aside from this, we are partnering with Coin Citadel (CCTL), who will be providing a ton of support to grow our mining business. They've invested a build out of a large mining facility for colocating. We will be moving into their space shortly to host our equipment, which will remove a significant amount of overhead and allow us to buy more machines. In affect, we are now the cloud mining division of CCTL now. I did manage to give Plattsburgh BTC a minor facelift too! Mining is officially back open now. Thank you for being so patient! Hey all! Just wanted to write a short blurb about a slight change in direction here: Plattsburgh BTC is moving away from doing timed mining contracts. This is for a few different reasons, including that sometimes the pools would be sick and not function well, running the miners through a proxy reduces efficiency, and constantly switching pools causes lost time by having to warm up. By mining through a single pool, at the moment Eligius, I've been able to optimize the mining rig. The performance has already seen about a 2.4% increase in hashing speed without the added proxy in between. As difficulty continues to rise, I wanted to take measures to increase returns for you guys. So instead of pointing the miners to a pool you chose for X amount of time, earnings for the whole rig are averaged over a weekly "round" to reduce variance a little. Then, payouts are determined by the number of shares you own for the current round. 1 share=1 day of hashing at the rated 19.07 TH. I've also been able to make smaller shares available this way, the smallest being 0.125 shares, or 3 hours of shared mining. I'm working on making the stats a little better for this. Once the orders are processed you can view how things are going as mining rewards are received by going to the share distribution link at the top. Rounds run from Monday-Sunday, with payouts sent out on Mondays. This is kind of an experiment at the moment to see how things go. I'd love to hear your thoughts on this, so drop me a line and let me know what you think! Been a little bit since I've written here, finals were a bit intense but I graduated! So theres that, and I have some good news: Rig A has been upgraded from 3.55 TH to 8.15 TH. 4 more Antminer S5's are running now, bringing the total hashrate offering to 19.07 TH. Christmas came early! Rig A: top 6 and the four on the right side, second shelf. Rig B: the rest of them. So this is super exciting! We're getting closer to the goal of 25 TH. I hope you all enjoy. Also wanted to thank all of my loyal customers for being amazing. I really value all of you, so I feel bad that I've had to make things a little more stringent, but I will try for this affect my current customers as little as possible. Recently, fraudulent payments have been getting worse, and this has forced me to pen a more strict policy for first time customers. I've been doing some detective work to sniff these out as much as I can, but its become apparent to me that the best way to do this is to change my policy. I'm lowering the limit for first time customer purchases to $40/mo. This also gives you a chance to give my services a test drive to see how the performance is (always excellent! :P). After 2 months or by submitting an identity verification, these limits will be lifted. This doesn't apply to current customers. I realize that these kinds of things can be intrusive, but I'm trying to make the process as painless as I can. It involves me mailing you a code and you taking a picture of an ID and a credit card you plan on using (covering up all but the last four numbers of course). I just need to verify that it's really you. I'll also send a 1 month 5% off coupon with the letter. And don't forget, the anonymity that comes with bitcoin is something I really believe in. Everyone is entitled to their privacy. I really don't want your personal information, but I feel this is the only way to make this safer for both Plattsburgh BTC to operate and for my current customers. Chargebacks keep the prices higher than I'd like them to be for contingency. If I can lower the amount of chargebacks I get, I can lower the prices. If you've got any thoughts on this please reach out! I'd love to hear. I hope you all understand! And of course, this doesn't apply to paying in bitcoin. I hope to continue to grow with you all and make this service available in the future. Happy holidays! Checking out with Bitcoin, using Coinbase. It wouldn't make a whole lot of sense for Plattsburgh BTC not to accept bitcoin. I've gotten a few requests about this, and I'm happy to say that we can accept bitcoin now. Initially, I was afraid that doing so would go against bitlicense legislation, since the wording is kind of vague in some parts. However, interpretation seems to be that this would be fine. After finding this out, I've just been waiting for verification since that can take a little bit, and everything should be working smoothly now. And because of the lower transaction fees, prices are 1.5% less when you pay with bitcoin! If your wondering, I decided to use Coinbase instead of Bitpay to process transactions. I really like their setup, and the checkout process seems to be really simple and straightforward. It gives a 15 minute window to pay to the address given, and once it's sent through it's instant. Just make sure that after the payment is processed you click "Return to Plattsburgh BTC," as this will allow you to input your mining pool details. I haven't commented on the expansion project in a little bit. Don't worry, it's still in progress, I've just hit a few snags along the way. Plattsburgh is a small town, and few people here have heard of bitcoin. Trying to explain how this works to local businesses I need to work with has been a bit of an uphill battle. And the owners of the space I'm looking to lease have unfortunately had a death in the family. Lastly, there's been some unexpected costs, so I've had to lower the initial expansion to about 10.35 TH for the time being. But aside from this, some good news! Nearly all of the equipment has arrived safely and is ready to go. The shipping gods have (mostly) been good to me. The lease is just waiting for the family to review things. So at this point I'm just waiting to sign the lease and get everything set up. Hopefully soon!